Where's Liz? 2014: Salvation Mountain and "The Slabs"
“The Slabs” is what remains of a Marine Training Base in the early 1940s during WWII. The name comes from the cement floors that were left after buildings were removed when the base closed. The land is now used for free camping. Many people live here year-round, and scores of snowbirds come every year to camp in the winter. It is an eclectic group. 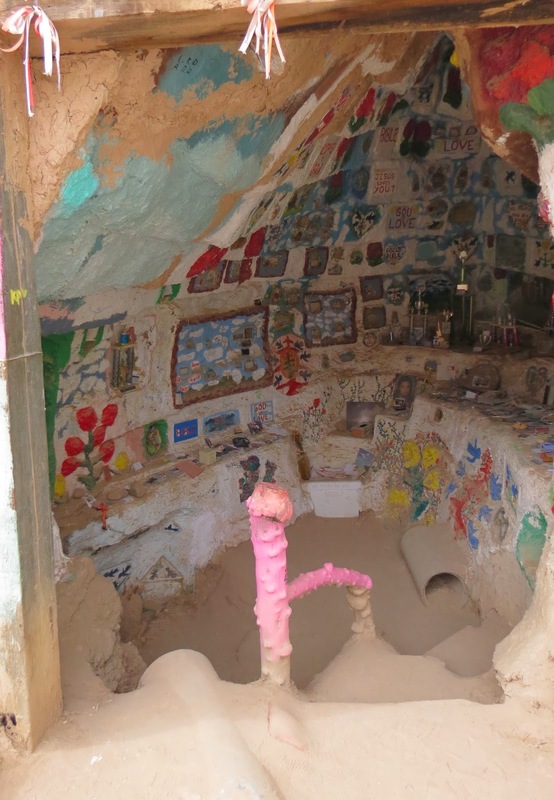 Leonard Knight settled here in 1984 and began work on what became his personal mission to share God’s love: Salvation Mountain. Turn on Main Street in Niland, CA and follow the road 3 miles. You can’t miss it. Leonard himself died just last week. This article explains a little about it. The monument itself is 50 feet high and 150 feet long...as high as a 3-story building and as wide as a football field. It is covered with colorful decorations with selected scriptures and prayers with the recurrent theme that God is Love. Leonard lived here in his truck camper and worked on the mountain for almost 30 years. His truck and other objects around the mountain proclaimed his message too. This sign greets visitors. Until he fell ill, visitors could meet Leonard here and share his ministry by helping him paint and maintain it. Beth says she met him 4 years ago, and added a dab of paint to the project. You are invited to climb the mountain by following the "yellow brick road." Paint is mostly donated, and if you plan to bring some, they request only water-based latex paint please. 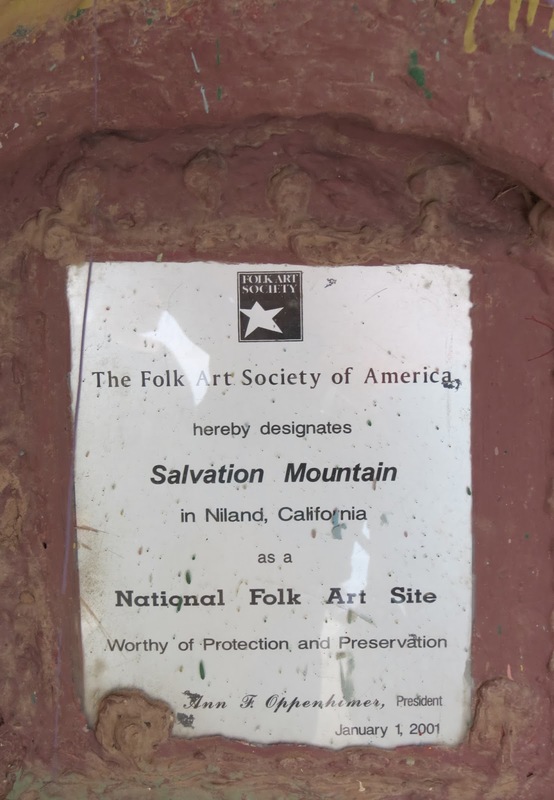 The mountain is made of local adobe clay, which Leonard used after an initial attempt to use concrete failed. Thistle stops to smell the flowers. The blue at the base of the mountain represents the Sea of Galilee. Beth and Peaches start climbing the mountain. You are asked to stay on the yellow brick road because other areas are fragile. Maybe letting the dogs come wasn't such a good idea. The view from the top. Fortunately, there's an easier way down on the other side. The view of campers at Slab City. One of the volunteers who greet visitors, and lend a hand when needed. Looking down at the back side of Leonard's most recent project, meant to be a museum. The old military base water reservoirs have been painted too, but not by Leonard. Looks more like an Anti-Christ artist's work. I won't show details because my grandchildren see my pictures. The one on the right seems to depict fornication in every conceivable way, using human-like bodies with animal heads. The tank on the left depicts the end of the world perhaps with atomic bombs, Napalm, and other acts of war and destruction. Someone had set up camp next to the left tank. 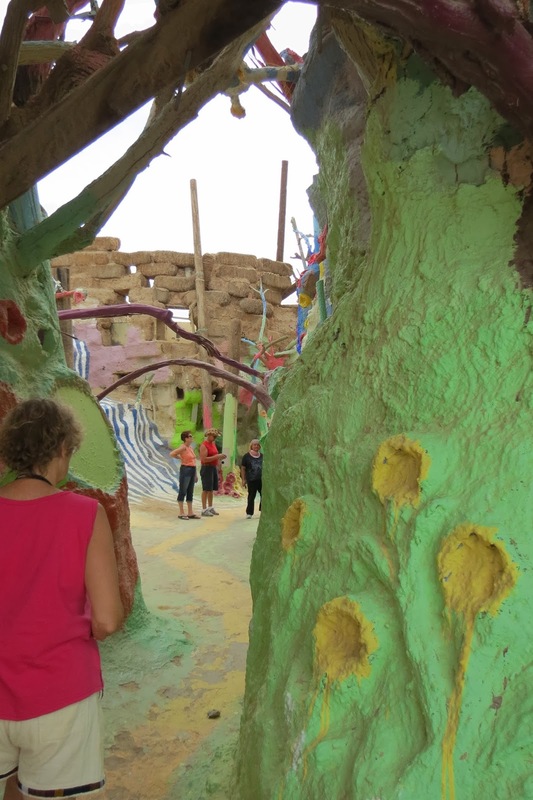 Back at Salvation Mountain there is a small model in the foreground, and the "museum" on the right. The "museum" was being built using old telephone poles, hay bales, and tires. Many tunnels lead to some displays. Leonard was working on this project when he fell ill and had to be moved to an assisted living facility. 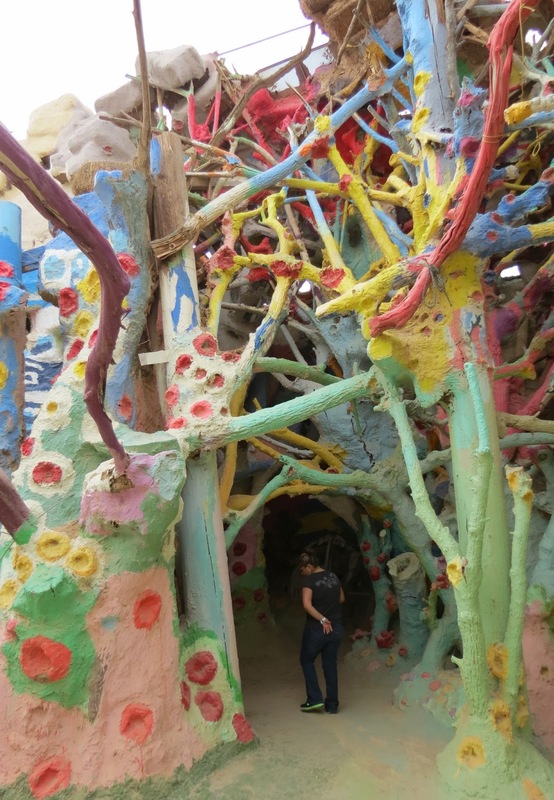 Salvation Mountain has been designated a National Folk Art site, worthy of preservation. 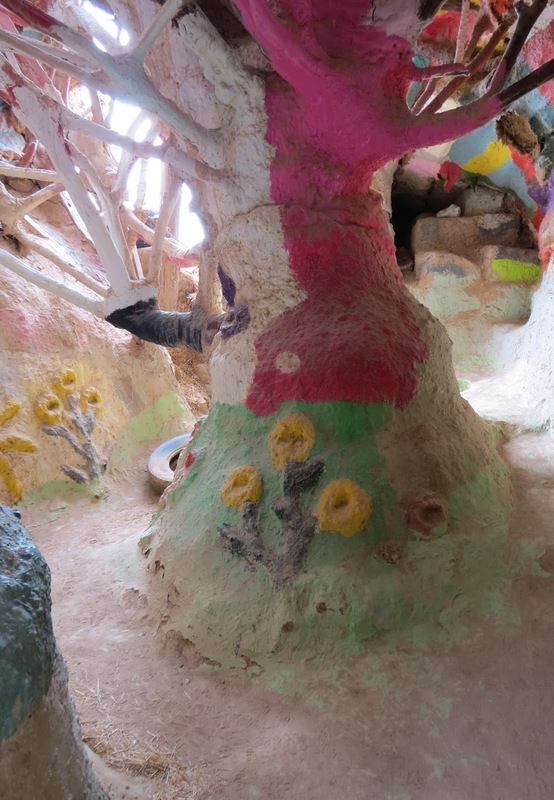 A nonprofit organization, Salvation Mountain Inc. has been given the task to raise money for managing the upkeep of the monument, providing a site manager, and for the feeding and caring for the Salvation Mountain cats. Leonard Knight grew up in my home state of Vermont. The cats are being cared for too. There was always room for expansion, and it looks like Leonard planned to do more. A place to sit and read the Bible? Someone has freshly painted the E.
It's what Leonard wants you to know. Interesting post, you got some better pictures than I have seen in the past. What a great place and I agree best pictures I've ever seen of it. I'd love to go there but Bill is such a snob - prude - he wouldn't. So I'll probably never see it. Thanks. Fascinating. I didn't even know this place existed. Just wondering . . . Is there an explanation for "Yellow Brick Road?" I might have named it "Golden Road to Glory" or something less ear-wormy. I agree, Mary Ann. Don't know why he chose that name, unless it just reminded him of the movie. Doesn't fit the theme though.